Ancient Jewish wisdom explains that God’s first explicit directive to people repeats the verb ‘to eat’ to tell us to perform two separate and distinct acts with every mouthful. We are to eat for both physical and spiritual reasons. That way we extract the full benefit from every morsel of food. Perhaps this helps explain that the more correct our attitude to food is, the more we will eat in an appropriate way leading to a side benefit of maintaining a healthy weight. The Torah asks us to say a blessing both before and after eating. The blessings relate to the specific food, forcing us to ask questions such as, “Does it grow in the ground or on a tree?”, “What is the main ingredient in this soup?”, and “Did I put peanut butter on the cracker because I was craving a cracker or was I craving peanut butter and needed a base for it?” This discourages mindlessly finishing our children’s egg so as not to waste it (we are not alternatives to garbage cans) or picking our way through a pantry shelf while tidying up. Ancient Jewish wisdom urges us to sit down to eat rather than grabbing something on the run. We recite a closing blessing on whatever food we ate, which means we make a conscious decision that we are finished eating rather than nibbling away for hours. As much as possible, we eat with other people rather than alone and are meant to craft the conversation in a way that elevates the meal so that it is a spiritual as well as a physical feast. For mothers with small children, this could translate into taking the extra few minutes to actually set ourselves a place at the table, complete with napkin and cutlery, and perhaps reading something uplifting while we eat, even if we only have a few minutes allotted to ourselves. Once our children are older, we can enjoy their company and make sure we are discussing interesting, age-appropriate ideas rather than eating in silence or gossiping. A benefit of thinking in this way about food is that it encourages awareness. While, unfortunately, like anything else, the letter of the law can be followed without the spirit, such as by hastily mumbling the blessing, if done correctly, we should be cognizant of each and every bite. We should also be consciously grateful to God for providing us with food as well as understanding that it is meant to serve the purpose of fueling our bodies so that they can accomplish great things. Our focus should be on taking care of the bodies God graciously allows us to inhabit, rather than on hitting certain weight points. Pregnancy and nursing are going to change our bodies just as a lived-in home looks different, and much more welcoming, than a museum with cordoned off exhibits. While women should make every attempt to look attractive for their spouses, being “put together” does not mean possessing the physical body of our eighteen-year-old selves. There is a difference between having a more ‘mature’ figure and looking slovenly or as if we lack self-respect. (Obviously while in the throes of morning sickness, or during those post-partum weeks, or while three kids are down with the flu, managing to change out of pajamas in itself shows enormous effort.) In a good marriage and as spouses spiritually mature, non-physical criteria become more important. If we had a sure-fire secret formula for losing weight, we would be on top of the Forbes 400 list of wealthiest individuals. What we do hope we have left you with, Melissa, is a change in focus from weight and eating to one of awareness of and gratitude for the food you eat. Most of all, we hope you and your husband have a respect for the wonders that your bodies let you achieve and a desire to take as much care of those bodies as you would give to any fine and precious machine. Thank you for this insightful approach to weight. As a man I struggle too. Keeping weight under control is essential for everyone’s health, men and women. In reading your (pl.) excellent response to this question I hear the voice of my late Father, who was not afraid to point out folks who were overly driven to eat. “Eat to live,” he would say, “don’t live to eat.” It seems that there are persons inordinately driven to eat (or drink, as it may be) in order to satisfy some deep unfulfilled need. And such needs are usually spiritual and often unrecognized. But such compensation is perilous: it is dangerous to eat to fill a lack of love, or to drink to assuage a lack of acceptance. For no amount of eating or drinking can fill the void, and more eating and drinking will result. Food and drink are useful servants. But addiction to any substance or practice is a bad master. If you learn to extract every ounce of spiritual sustenance in each mouthful, you end up eating less. Your dad was quite correct on this, and, I suspect, on a few other things too. I would just like to add to your excellent advice that recently there have been numerous studies released warning people to stop eating any food that is labeled as “low fat”, “heart healthy”, or “no fat” etc. These products have been altered with chemicals (many of which have been banned in every other first world country!) that are foreign to our body causing the brain, not knowing what to do with them, to encompass them with…you guessed it…fat!! Since these products have been on the market our obesity rate has skyrocketed! Google “Fat doesn’t make you fat” and you’ll see several of the newest findings which debunk the government recommended dietary guidelines. (Who would have guessed🙄) Try to eat food that is as close as possible to it’s natural state; whole milk, real butter, farm raised eggs and local fruits and veggies. Then make sure you are relaxed and in a balanced state of mind through prayer. Eat slowly and enjoy the company of the ones around you as they enjoy you. Yes, Lisa, it’s amazing how one recommended diet is touted as the worst diet a few years later and vice-versa. The responses to this Ask The Rabbi column have taught me that everyone has his or her own approach to healthy eating. Mine is moderation in everything. Over indulgence occurs with peanut butter for example, fatty and sugary foods, certain designed foods that don’t register in the brain like fruit, beans, vegetables ( Natural foods) … If you reduce sugar, manufactured carbs, excess oil , animal fat … which is in the Old Testament… and so is a warning against, strong drink, sugary breads and animal fat…. You don’t need dairy to be healthy… nor fish but veggy diets must included a good sourse of B complex. Unless you know where the food if from there is risk. Rememder the Daniel story? He refused the kings meat… ate veggies. Maybe thats why the Lions didn’t eat him…. he smelled like greens. Moderation must be applied to the content of food… Eggs contain more animal fat and farm chemicals than a bananna. A coke contains more sugar than 50 pounds of sugar beets. Love your writing and business ideas and facts from the Bible. I may be ill-informed, but the way I see it, if chemicals like sodium nitrite can preserve hot dogs so effectively, just imagine what wonders they are performing for me when I eat hot dogs. In general, my perhaps ignorant but enjoyable approach to food is anything in moderation. Maimonides does give advice as an ancient Jewish physician and sage. Among the advice is chew your food thoroughly (slowly) and eat until you are about 80% full, then stop. This works well for eating less food. Eat fresh and not processed food, drink lots of water, and cut way down on sugar. Sugar substitutes are bad too. With Maimonides’ advice and yours, I think we’d all do well. Thank you once again for an uplifting response to someone’s question. I liked your point about beginning and ending your meal with a blessing in order to make a clear delineation between eating and not eating. Eating is clearly a sacred act, and likewise, not eating can also be a sacred act. Fasting from food at times allows us to experience a deeper connection to our Creator. And fasting in the Torah is coupled with prayer. From a health perspective, proper delineation in eating and non-eating times will help our body to balance itself. Continual eating is out of balance and causes a host of illnesses and health problems. We actually have an audio CD, Day for Atonement, that discusses why fasting is an integral part of Yom Kippur, the Day of Atonement. Unfortunately, too many people think it has to do with needing to suffer on that day, which is completely incorrect. Wow!! I can’t recall the last time I have been so enlighten in regard to food. Thank you so much for this article. We’re delighted when we write something that is valuable to our readers. Thanks for letting us know, Lisa. This is a wonderful description of the human need for food, and it is both a physical and spiritual need. Twenty years ago, I had two toddlers and an 11 year old. Our eldest was in school at that time regretfully (we’d have home educated, had we understood the costs vs. benefits back then.) However, I would get dressed up and then dress my toddlers up for outings in downtwon Seattle. Often, we’d sit down to a light meal or a treat at a fine restaurant (the Space Needle was a favorite to get ice-cream, for instance, but it later banned the practice of eating only dessert in its spinning restaurant.) We enjoyed the sights and the people (many elders at adjacent tables would get up to leave and then they’d approach us to compliment the politeness of my toddlers.) I was teaching them thankfulness to God before and after our treats as well as how to be civil. These two young adults, at 22 and 21 years old, continue to express gratitude and civil behavior with everyone they encounter, and mealtime together is a joy. However, there was a seven year period that I had weight trouble. In addition to letting myself down after a successful life of being healthy, I let my Creator down during that time. Women are made with naturally occurring changes. An additional factor was in play for me then, I had to have surgery on my forearm for Melanoma Cancer that I caught early thankfully! I decided to count calories daily. I ate very limited calories daily but I did not buy any of those fad plans. Rather, I simply counted the calories and allowed a daily count of not more than 800; this count can be adjusted from person to person. I ate really simple foods and ingredients: nuts, greens, fruits, canned fish and on occasion a few meats: poultry or beef (mostly I ate nuts though). I chose to never eat anything with High Fructose Corn Syrup (corn syrup, occassionally but never when it’s “high fructose”.) I also cut out “Modified Starches.” Corn, Potato or Rice starches that have been modified in any way, I stay away from them. So, I take longer to read everything I might buy in the grocery store than I did before. It’s been about three years since then and my own plan is so simple for me to follow; many women I know did not think that my weight was anything to trouble myself about but it bothered me a lot because I felt “weighted down.” Now, I can eat more than 800 calories per day. I am short with small bones, so any weight more than normal can make me feel too weighted down. Soon, I’m planning to begin weightlifting with my husband, and our young adult daughter and son. Some people I’ve spoken to about ‘how to lose weight’ say that they could never follow the daily plan of counting calories; but many of those folks I’ve spoken to about it are still quite overweight (even more than I was when I began to count calories daily.) I no longer count calories, but I’m careful about eating. We eat healthy foods and, we eat healthy sweet treats. We stay away from most “fast food” chains. My family and I continue to enjoy the blessing of abundance within limits, and we hope others do too. BTW: I wrote this before and after here because eating is a lifelong reality. The choice to eat with control is as important to us as taking in our daily Bible reading and prayer. Humans’ spiritual and physical needs are continuous until death. Elevating our daily meals to their higher purpose is a decent choice for all parents to make. Yours in an inspiring story. Another Gem of Ancient Jewish Wisdom–and so simple! 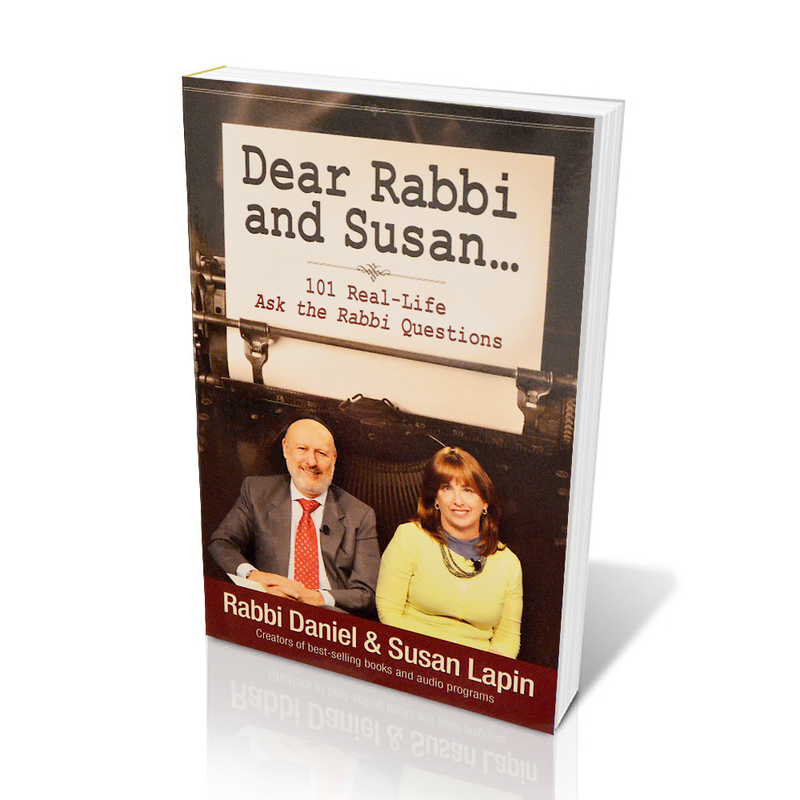 Thank you Rabbi Daniel and Susan! Eating carry out and eating alone causes me to eat unhealthy and more than I should. I’ve found when I dine with others (at home or eating out), I do eat less. An extra benefit of cooking at home is I normally make a healthy meal–like tonight I made roasted chicken, rice with peas and salad. It was delicious as well. Praying before and after a meal sets it apart as spiritual fellowship, reminding us of the importance of community. Redirecting my eating habits and seeing results will take time–but following God’s plan makes the journey enlightening and enjoyable. Thanks again! We’re so glad you found this useful, Robin. And you dinner sounds delicious. And inviting someone to eat together with and share it might make it even tastier. Very interesting, thank you for sharing this ancient Jewish wisdom! Would you mind expounding on what the blessings are at the beginning of a meal that would cause you to ask about your food “Does it grow in the ground or on a tree?”, “What is the main ingredient in this soup?”, and “Did I put peanut butter on the cracker because I was craving a cracker or was I craving peanut butter and needed a base for it?” Are they certain particular blessings you recite and if so where can I find a copy of them? Wendy, the blessings that we use are in Hebrew, but in effect they focus on whether what we are eating is the fruit of the ground or grows on a tree or is a type of grain, etc. So, you are really thinking about the source of your food and what the main food you are eating is. Hope this helps. I liked this article. I have been looking for insight for food in the word of God. From Genesis where God instructs us to eat fruit from every tree of the garden, to the clean animals and the recipe for bread found in Ezekiel 4:9. I would like to add: most of food today are full of chemicals that storage in our cells. Those fat-cells storage more chemicals and thus our bodies became intoxicated and unable to lose weight. What worked for me was: no more than 35 mg of carbohydrates max 50 mg. per day. I invested in my health. I starting purchasing organic food. Removed sugar, fructose from my diet. I have lost 8 kilograms. 1 pound per week. Remember that food can be the cause of any illness on the human body. I kept God advice: Isaiah 55:2 Why do you spend your money for that which is not bread, and your labor for that which does not satisfy? Listen diligently to me, and eat what is good, and delight yourselves in rich food. * Rich food is the one that is good for us. We all know how bad fried or black grilled food it is (Cancerogenous), along with fast food, which is full of calories. Sodas should be off limits. Is highly toxic. All the good for anyone looking to lose weight. Eat what is good.